Pico Cleaners offers you 37 years of professional laundry and cleaning services for your garments, rugs or drapery at competitive prices. Windows are focal points in any home, so we clean and maintain your drapery and window treatments with the best care. Pico Cleaners offers free pick-up and delivery service for all of your cleaning needs, so your errands don’t slow you down. Save on Pico Cleaner’s amazing dry cleaning services with coupons and promotional offers. Ready to schedule your FREE dry cleaning pick-up and delivery? Our cleaning services are certified green by Greenopia and GreenEarth Cleaning. We’ve been dry cleaners in Los Angeles for over 30 years. 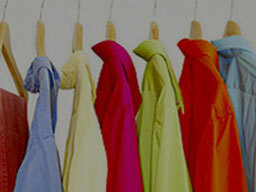 Throughout the years we’ve continued to offer fast and efficient dry cleaning. Those services include dry cleaning, shirt laundry, free pick-up and delivery, alterations, and leather cleaning. Leave your clothes in our hands and we’ll handle with care. We take pride in being part of a business that provides people with fresh clothes. Shirt laundry is a great way to look sharp in your business attire. We want to make sure you look professional for work and for events. Our dry cleaning in Los Angeles keeps your brights, bright, your whites, white, and your smile, wide. Our free pick-up and delivery in West Los Angeles is a service that our customers rave about. It saves you time at your convenience so you can carry on with your day while we come to you. With experienced tailors and seamstresses on staff, alterations are easy. For those who wear leather and suede, don’t worry about your garments. We apply the best methods to clean your clothes without damaging the material. At our dry cleaners we make sure to fluff and fold for you (with the exception of pants and collared shirts of course). Aside from some of the same day dry cleaning services we offer in West LA, we also offer luxury dry cleaning to keep your closet looking good. Shoe and handbag cleaning is a great way to spruce up your shoes and handbags. Hitting the pavement can be rough but our shoe repair service isn’t. Drop off your pair of shoes to be repaired by professionals. Also for those who have had the pleasure of getting married we have a beautiful wedding gown cleaning and preservation to help you cherish your special day forever. More than just dry cleaners we also provide a home service with our environmentally friendly cleaning services for your carpet (removing spots, odors and stains), for your upholstery (it takes time and money to decorate a home, we take care of your fabric and goods), and for your drapes and windows (we have a drapery cleaning and window treatment that leaves them looking spotless). 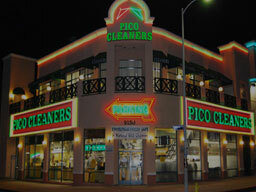 Los Angeles dry cleaning has been made easy at Pico Cleaners. We keep our customers coming back for more of our dry cleaning services. Because of our dry cleaners prices and the fact that we’re dry cleaners open on Sunday, we’re the perfect place to bring your valuable clothing. Be sure to come by for our services at 9150 West Pico Blvd in Los Angeles. And we’re always available to answer questions over the phone at (310)724-2431.